The Dead Rabbit RDA by Hellvape & Heathen offers a beautiful look into the world of rebuildables with an all-new 24mm RDA that’s remarkably stylish, while providing an innovative build deck that enables larger builds for intense cloud production. Designed in the USA, Hellvape and Heathen collaborated to bring the vape community an innovative RDA that’s capable of housing nearly endless styles of builds, no matter which type of vaper you are. The Dead Rabbit is equipped with a top-terminal four post build deck and a massive 5mm juice well that sits at the bottom of the tank, keeping your e-juice inside the tank and cutting back on how often you need to saturate your wicks. Each top-terminal post measures at 2.5mm across, providing ample space for the larger coil builds and is fully-functional with single-coil setups. The Dead Rabbit RDA arrives squonker-friendly with a secondary hollowed-out Gold plated bottom-feed pin that can be used in place of the original 510 for any squonker mod. Constructed out of high-quality 304 Stainless Steel, the Dead Rabbit RDA has been built to last and is available in Stainless Steel, Matte Black, Gold, and Rainbow for your all day vaping pleasure. Hellvape wanted the Dead Rabbit to stand out, which is why they included a beautiful 10mm wide bore 810 Resin drip tip that arrives in either Green, Purple, or Red styles. Hellvape also includes a 510 drip tip adapter that enables you to use any of your favorite 510 drip tips with this atomizer. Customizable airflow is a must, and the Dead Rabbit takes airflow to a new level. This RDA features two top-side diagonal adjustable airflow slots that measure 10mm x 2.5mm each, giving you the ability to hone in on that perfect flavor with a new design that closes completely to minimize leaking. Near the drip tip, Hellvape added a knurled grip to the top cap to provide increased grip when looking for that perfect airflow sweet spot. Heat-retention in RDA’s can be a huge problem for larger coil builds in any tank, but not with the Dead Rabbit. Hellvape constructed a PEEK Insulator that sits just below the quad posts to help quickly dissipate heat, no matter what kind of builds you’re rocking. 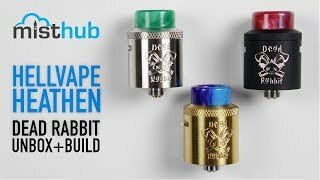 If you’re looking for a new and stylish RDA that can bring the flavor while looking awesome in the process, Hellvape and Heathen have created something magical with the Dead Rabbit RDA. If you plan on scooping up the Dead Rabbit RDA, be sure to check out our wide selection of CoilMaster Pre-Wrapped Coils and Organic Cotton options to ensure that you’re getting the best vape from your brand-new tank!